Increasingly, team-building trips are becoming popular among companies that want to reap the numerous benefits of a more cohesive workforce. According to www.innovativeteambuilding.co.uk, companies that engage in team-building activities can expect to enjoy improved morale, leadership skills, organizational productivity, and an increased ability to identify challenges. Often, team-building trips take place at camps or lodges, which allow employees to step away from the rat race and connect on a deeper level with their coworkers. Typically, activities such as white water rafting, rope courses, or kayaking, become part of the to do list—these are a great way for employees to enjoy the outdoors while at the same time developing their teamwork. 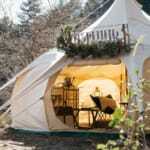 Here in Japan, there are plenty of camps and lodges that can serve just this purpose—following are descriptions of three such companies, each of which provides a very different type of service. From a relaxed outdoor getaway, to an adrenaline rush, or a visit to a microbrewery, there truly is a trip to suit every corporate culture. Most of these locations also offer individual or family packages, perfect for kicking off the summer with an active, outdoor, weekend away. Discover Japan operates several programs such as the Nanbo Discovery Summer School, winter ski camps for the whole family, or the Nanbo Discovery camp for school children. For adults looking to get away, however, Discovery Japan offers the Nanbo Kokusai Mura, a lodge and seminar house large enough to house thirty-two people in four bunk-style rooms. Just 200 meters from a white sandy beach, the lodge is located on six acres approximately two hours from Tokyo Station. Along with a large, covered outdoor cooking area, Nanbo staff can prepare meals, and an indoor kitchen is also available to groups. Also indoors are plenty of facilities perfect for seminars and group discussions such as the first floor Discovery Room or the upstairs lounge, dining room, and deck area, perfect for relaxing after a long day. The lodge is also equipped with wireless internet. Outdoors, the lodge offers Trek mountain bike rentals free of charge and there are trails for all levels in the surrounding area. You can also enjoy hiking, a day at the beach, or tennis at the nearby rental courts. www.discoverjapan.co.jp. If you’re looking to get your employees’ adrenaline pumping, then check out Canyons, which offers a full slate of adventurous outdoor activities. With three bases within two hours of Tokyo and a fourth one on the Yoshino River, there is more than likely to be a location to suit you and your needs, and get your blood pumping! Offering tours and courses in rafting, caving, snowshoeing, skiing, and, of course, canyoning, a team-building trip to one of their sites may not be for the faintest of hearts. Rest assured, however, that although your hearts will be pounding, Canyons’ trained international staff will ensure that you stay safe and happy as you abseil and jump down cliffs and waterfalls, while canyoning, navigate the rapids in a raft, or snowshoe like an early adventurer. After such an adventurous day, you, your staff, or family will be comfortable in one of Canyons’ partner accommodations providers, or, if you head to Minakami, the Alpine Lodge, run by Canyons’ bilingual staff, which features bunk and tatami rooms, central common areas, internet access, and easy access to skiing and snowboarding in the winter and canyoning, caving, and rafting in the summer. Of course, for anyone looking for something slightly more sedate, hiking, snowshoeing, and a trip to the onsen are nearby as well. www.canyons.jp. Nestled at the foot of Mt. Fuji, the Gotemba Kogen Resort offers several types of accommodation including a perfect option for groups—the Blueberry Lodge—a group of 68 Western-style two bedroom condos, each equipped with cooking facilities, private washrooms, and free entrance to the Ringo onsen nearby. The Gotemba Kogen Resort itself houses an entertaining collection of shops and restaurants including a pottery studio and microbrewery (that uses run off water from Mt. Fuji in the brewing process), a collection of restaurants, and seven soccer fields. Besides that, they have a series of four onsen for your enjoyment and relaxation and nearby is the Gotemba Premium Outlet (http://tinyurl.com/3acc2r), a collection of over 160 stores. Other activities nearby include fishing, horseback riding, visiting the Fuji Speedway, and hiking, both up Mt. Fuji or in and around the Hakone National Park. www.gotembakogenresort.jp.